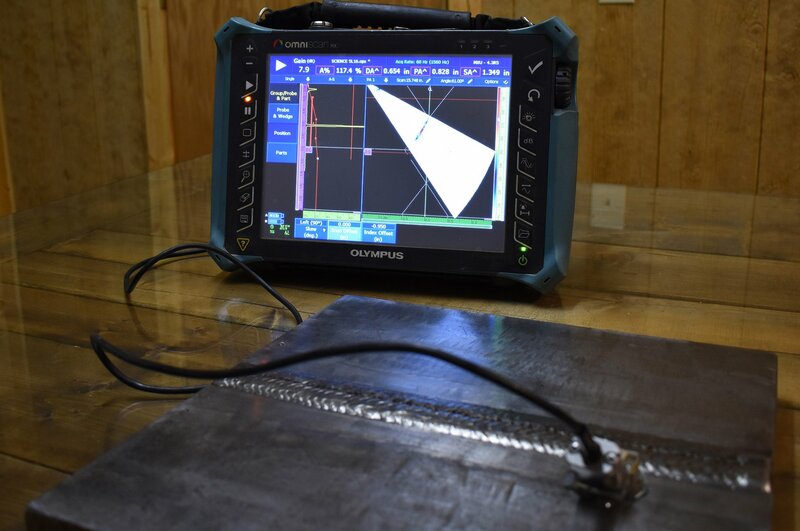 Phased Array Ultrasonic Testing (PAUT) | Call XCEL NDT Today! Phased Array Ultrasonic Testing (PAUT) is universally capable of assessing almost any damage mechanism where conventional ultrasonic flaw detectors have been used. Weld inspection and crack detection are common applications, and these tests are done across a wide range of industries including oil and gas, petrochemical plants, power generation and chemical industries, especially for the construction of new piping, pipelines, vessels and structural welded materials. Phased Array can also be effectively used to profile remaining wall thickness in corrosion survey applications when surface condition and part geometry allows. A Phased Array probe is composed of several small ultrasonic elements which are individually pulsed. By varying the pulse timing of all elements, the ultrasonic beam can be ‘guided’ in a certain angle and focal distance. Therefore, a variety of beams can examine an object thoroughly. Information can be displayed in multiple display formats (examples below), which aid in discontinuities/ flaw detection. The data can also be captured and stored for inspector review. This also makes future reference and inspections easier. The replayed data can be processed and displayed in various ways using the instrument used to acquire the data or on analysis software that provides additional processing capabilities. Material of piece being scanned. Course grained materials and exotic allows can attenuate Phased Array UT energy the same way it will attenuate conventional UT energy and cause limitations to the inspection.